These notes are additional information related to the geological trail guide to Ribchester produced by GeoLancashire. 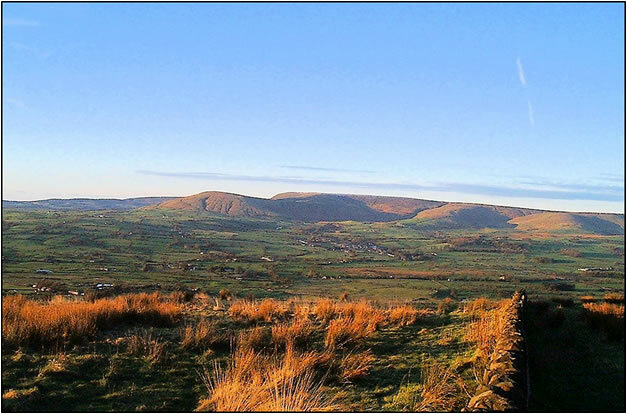 Lancashire as a whole is dominated by red Triassic sandstones in the west of the county and brown Carboniferous sandstones to the east with small areas of limestone around Clitheroe and Leck Fell. Most of the lowlands and river valleys are plastered with glacial till with patches of fluvio-glacial sand and gravel important locally. 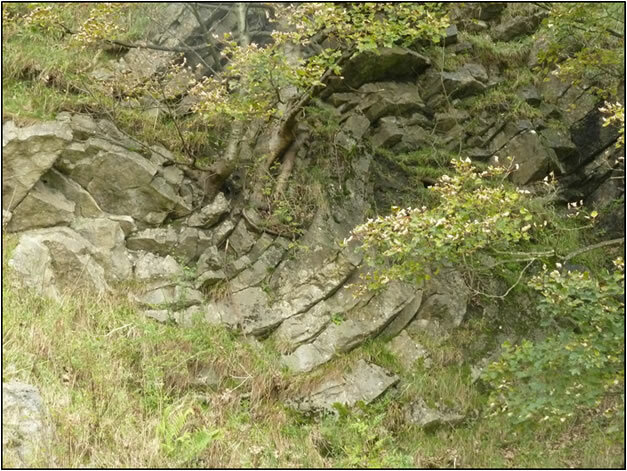 In this part of the Ribble valley, exposures of the solid bedrock are very limited by widespread till deposits. The high ground to the north and south of the valley however, is dominated by the coarse Namurian (Millstone Grit) sandstones – approximately 320 million years old – which have partly resisted erosion and partly owe their elevation to folding. Most of these rocks were laid down in a tropical marine basin between two huge closing land masses to the north and south. This was fed by river channels mainly from the north and east. 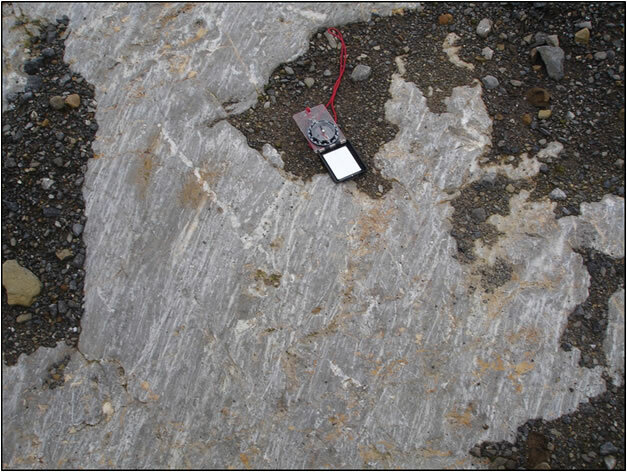 The oldest, so lowest, Pendle Grit beds are made up of particles of many different sizes from fine muds to large ‘clasts’ which were ripped up from the seafloor over which the current was flowing. They are said to be poorly sorted in terms of their particle size and they also show evidence of slumping and sliding as they moved down the sloping sea floor. The main body of Pendle Grit is much more sorted, however, than this early stratum. Close to the coast at the time of deposition, the currents carrying the sediment moved relatively rapidly. They were high-energy flows which were able to transport coarse, pebbly, sediment. As the current moved lower down the sea floor slope, it gradually lost energy available for transportation so was able only to move progressively smaller sized particles. In the field, Pendle Grit is typically a buff-coloured, medium to coarse-grained felspathic sandstone. It commonly occurs in massive beds up to 4.5m thick with little internal structure. Although it is often interbedded with silt and mudstones, these thick beds and uniform character make it one of the most widely used building stones in Lancashire. Thus, much of Georgian Lancaster is built of Pendle Grit won from extensive quarries in Williamson Park and many of the stone buildings of Preston, such as the Harris Museum and the Church of St John the Divine, are from the major quarries near Longridge. Although the pebbles which make up the surface of the track south of Ox Hey Barn (SD6255 3528) are almost certainly not in situ where they were originally deposited, they have probably been collected in the immediate area to surface the track. Dig a pit anywhere nearby and similar material will be found. The bedrock underlying the Ribble valley at this point is the Sabden Shale – 600m of mudstones with marine fossil bands which lie above, and are younger than, the Pendle Grit described above. Smeared on top of that however, is a layer of glacial till of variable thickness. This ‘lodgement’ till – or diamict – is the most characteristic glacial deposit in lowland areas. It may be laid down from ice at the sole of the ice sheet in a number of ways. Although very variable, it’s essential character is that of a matrix of fine particles in which are set much larger pebbles or even boulders. The majority of the materials making up the mix are derived locally but a significant proportion of the pebbles typically consist of rock types which are more resistant to attrition. Apart from being made of an obviously different rock, these ‘foreign’ pebbles are also usually more rounded (though sometimes with definite flat, polished surfaces) and often show clear scratches, or striae. These were acquired in the course of transportation the often considerable distances by the ice from the point where the pebbles were originally entrained from the bedrock. Sometimes these foreign rocks, or erratics, have come from a comparatively restricted outcrop of very distinctive rock and given that the only available method of transportation has been moving ice, it is possible to reconstruct the route which the ice has travelled. Shap granite is just such a rock – very distinctive and from a restricted source. By plotting its occurrence in tills across northern England it has been possible to show the directions of ice flow from the Shap area at different times during the last glaciation. Returning to the erratics found between Ox Hey and Red Bank Woods, the first things to catch the eye are the markedly different colours and roundedness of these pebbles. The colours are the best clue as to their provenance with the dark greys, blues and greens of Borrowdale volcanic rocks from the centre of the Lake District standing out sharply. Another group of distinctive rocks are limestones. These are usually grey but one distinctive group from Craven is black with prominent calcite veins. These could only have come from near Clitheroe so immediately tell us that ice from the Yorkshire Dales passed this way at some point. Recently exposed limestone, Clitheroe. The prominent white scratches or striae have been created by harder rocks embedded in the basal ice; they are all oriented towards the south-west indicated the direction of ice flow. Apart from the eye-catching colours of these far-travelled erratics, the types of rock over which the ice has travelled can affect the colour of the fine-grained matrix material. 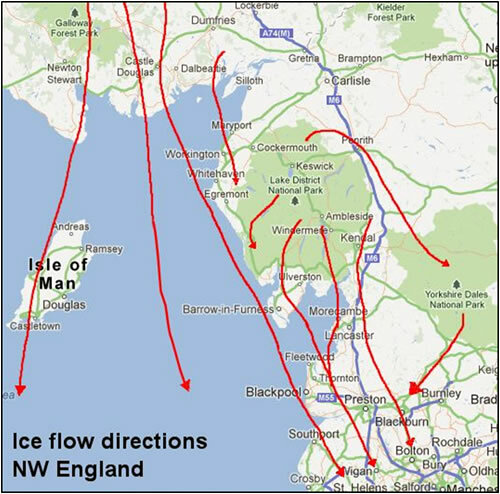 If we consider first the ice flowing from the Lake District: once it left the highlands it soon moved down into Morecambe Bay and across the Lancashire Plain. We have seen how these areas are dominated by Triassic rocks whose distinctive red colour comes from the high levels of oxidised iron which they contain. This in turn ensures that the overall colour of the till reflects the red Triassic rocks from which most of it was derived. Where the ice has travelled any distance over limestones, apart from its till containing limestone erratics, it also overall tends to have a definite blue or blue/grey colour. By mapping the occurrence of these different coloured tills alongside the erratics, geologists were able to show quite early on the routes by which ice had travelled to any particular location and the extent of the area covered by ice from any particular area. The development of the present-day drainage network and associated river valleys began with the uplift of Britain – initiated about 65 million years ago – from the sea which covered it for much of Upper Cretaceous time. This was not however, a simple matter of sea levels falling relative to the land. For a start, the history of the Ribble valley in Lancashire is different in some respects from the Yorkshire Ribble. Also, there is no clear and agreed sequence of events leading to the location of the rivers in their present positions. For 150 years up to the middle of the last century, much of British ‘geomorphology’ was concerned with trying to build a sequence of landscape-forming events around the ideas of marine planation and sub-aerial erosion. Classically, these processes were regarded as leading – to varying degrees – to the formation of a ‘staircase’ of more-or-less level ‘planation’ surfaces which the emergent river system drained and dissected, establishing the lines of the major river valleys as we know them today. Over the past thirty years however, it has become evident that neither of these sets of processes stands up to detailed scrutiny nor possibly do many of the supposed planation surfaces. That being so, a new approach has been called for. Unfortunately, in the meantime, research interests have moved more towards detailed process studies and away from large-scale reconstructions of this type. The issues however, remain and may be encapsulated in a few simple questions primarily concerned with establishing how and when over the long term – measured in millions of years –the major valleys were formed. These valleys are those occupied by the present River Ribble downstream from Hellifield; the Hodder valley, and Chipping Vale north of Longridge Fell. The assumption that tends to be made is that, with one or two exceptions, major valleys occupied by rivers have been created by rivers. In many instances this is certainly the case. But even if it is, it sometimes does not help much to relate the present river to the valley which it occupies. Consider two of the three valleys above: the Sawley to Preston section of the Ribble valley and Chipping Vale. The present river occupying the lower Ribble valley has only existed since drainage become re-established after the last glaciation, perhaps 15,000 years ago. 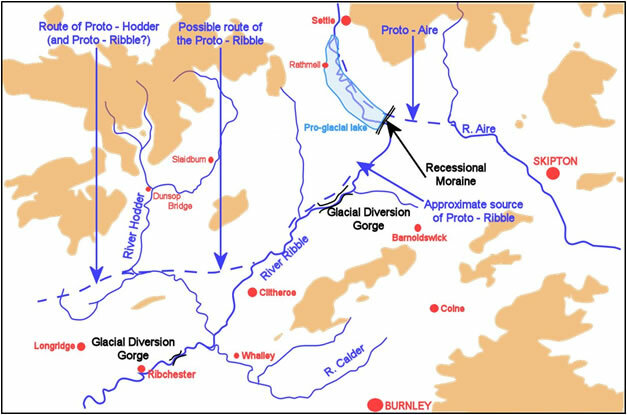 Today’s Ribble above Preston drains a catchment which is nearly double its pre-glacial predecessor which did not extend into Yorkshire or include any of the Hodder basin. Clearly, 15,000 years of post-glacial erosion has not produced a Ribble valley of the current dimensions on its own nor did the much smaller proto-Ribble. Turning to Chipping Vale, here we have another valley which is even wider and deeper than the lower Ribble but whose only river is the tiny east-flowing River Loud which has barely played any role in its production. The standard explanation is that pre-glacially the Vale was occupied by the River Hodder which after the last ice melted was unable to re-establish itself along its old route now blocked by a huge mass of glacial deposits across the westward end of the valley. This appears to be a plausible explanation but there still remains a discrepancy between the gross size of the Vale and that of the pre-glacial River Hodder. One possible mechanism to upgrade the erosive potential of a proto-Hodder is to add to it the discharge of the upper proto-Ribble instead of this being routed along the present lower Ribble valley. Johnson( ) has already claimed that the pre-glacial Ribble flowed north of the Paythorne glacial diversion gorge and it is not inconceivable that the river continued on a more northerly route through the Waddington area to Stakes Farm (SD646437) where in joined the Hodder and continued west through the Vale and out into the Lancashire Plain. Two problems with this are that the relatively small addition of the upper Ribble discharge, even over a protracted period of time, would still not appear to account for the large size of Chipping Vale. Also, if the upper Ribble discharge is removed from the lower Ribble valley, how has that been eroded to its present dimensions? Part of the answer to both these objections almost certainly lies in glaciation. Given that the area has been glaciated on several occasions over the past 2.5 million years (Ma), what we see today is the cumulative effect of these repeated ice incursions whose erosional impact may well have been much greater than that of the interglacial processes. This assumes that the ice streams followed more or less the same valley routes but this still begs the question of what factors led to the initial erosion along the present valley alignments. At this point we need to go back to the geology of the Ribble basin, and its structure in particular. By about 300 Ma the deposition of the Carboniferous rocks was coming to an end because the marine basin which was the focus of that deposition was becoming squeezed between two approaching tectonic plates, Laurussia to the north and Gondwana to the south. This was the start of the Variscan mountain-building period and although its impact was felt more in northern Europe, the rocks of north-west England were affected by a sort of ripple effect. Different sorts of rock behave differently when subjected to the pressures of plate collision. Some are able to absorb energy by rucking up into a series of folds while other more rigid rocks tend to fracture or fault. In the Ribble basin both faulting and folding is present and these tend to be oriented along axes perpendicular to the direction of plate movement which was from the south-south-east. Although there are major faults through the area having a north-west to south-east alignment, many more are approximately at right angles to these. Folding is particularly well developed in the area known as the Ribblesdale Fold Belt. The orientation of the folding is roughly parallel to the faults – that is, east-north-east to west-south-west. Wherever systems of folds and faults are organised along a preferred orientation it is likely that some beds will be more vulnerable to weathering and erosion than others. This may be accentuated by the shattering of rocks adjacent to individual or groups of faults. 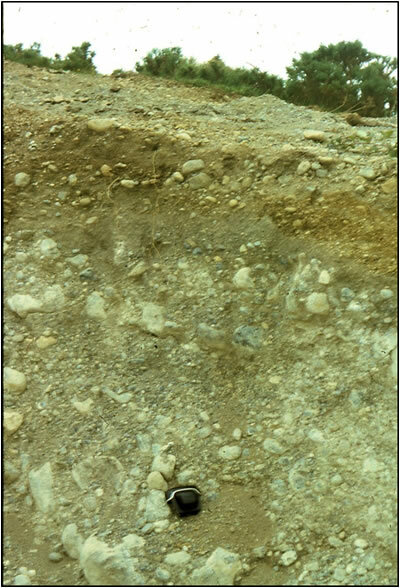 Wherever denudation occurs, it is these less competent rocks which are more likely to be eroded leaving the resistant rocks as elevated elements in the landscape. It is now thought that denudation occurred in Britain throughout Cenozoic time (65 – 2.6Ma). With fluctuations in the climate this would have taken different forms and occurred at varying rates but always the main tendency would be for the weaker rocks to be removed. A series of ‘declivities’ was eroded parallel to the main ENE -WSW structural trend which were the precursor of today’s Ribble-Hodder-Chipping valley system. With the onset of the Pleistocene glaciations, ice moving through Ribblesdale would also tend to differentially erode these incipient valleys especially when for other reasons there was a tendency for that ice to flow in a south-westerly direction. The amount of interglacial erosion cannot be known though fluvial erosion, prolonged periods of periglacial conditions and possibly periods of sub-tropical climate may well have led to the continued widening of the three main valleys. Finally, apart from the general tendency for ice flowing repeatedly down a valley to erode that valley further, we need to examine the impact of the last, Devensian, glaciation in more detail. Such an examination has to be confined to the Devensian since each glaciation destroys or modifies in unknowable ways the impact of previous glacial – and interglacial – events. Prior to the advent of Devensian ice inundating the Ribble valley, what was the river system like? With the advance of ice from the Arctic during the long run up to the maximum glaciation at ca 22Ka, global sea levels were depressed to a low of 100m below OD to which the rivers cut down. This incision led to the creation of deep valleys beneath the coastal plain, valleys which in some cases were eroded even deeper by subsequent ice and meltwater before they were in-filled with till, sand and gravel (Williams 1975). The location of these buried valleys is important in determining the route of the pre-Devensian rivers. However, our knowledge of the buried rockhead surface is largely dependent on having a good distribution of borehole data. Regrettably, this is not the case in the south Fylde so that while there is enough evidence to indicate some low and high rockhead areas, it is insufficient to create a clear picture. Also it must be remembered that the rockhead topography maps which form the basis for interpretation are all highly provisional. If hand-drawn, it is all too easy for the operator to allow unwarranted preconceptions to determine the position of any given contour; if computer-generated, it is possible to arrive at different solutions to the central interpolation problem by using slightly different algorithms. Notwithstanding these caveats, it is thought that south-west of Garstang a complex system of buried channels exists with bedrock proven at -36m OD at one point. Boreholes further west and in Blackpool suggest the possibility of a deep channel extending south-west beneath Great Eccleston to the present coast. South of that again, there appears to be a rockhead high with several values in the 0 -12m OD range possibly forming a low east-west ridge north of the M55. Between the M55 and the Ribble estuary most boreholes indicate another trough deepening towards the west where rockhead altitudes of -49m OD are recorded at the end of the motorway and -100m OD below Blackpool Tower. As already indicated, Magraw (in Earp, et al 1961) suggested that the proto-Hodder flowed west through Chipping Vale rather than following its present south-eastern route to the Ribble confluence. If that were the case, as seems plausible, it would be expected that the proto-Hodder would have cut a now-buried valley west of the M6 and that this would lie somewhere between north Preston and Garstang. Of the two possible declivities mentioned above, that between the M55 and the river would appear to be the most likely since it is more convincingly aligned to the Vale of Chipping and regional structures than the northerly route. 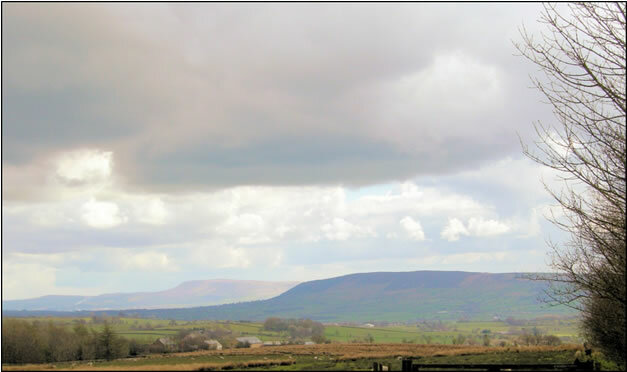 Turning to the present-day lower Ribble valley, the first point to make is that virtually throughout its length above Preston bedrock is either at the surface or – downstream – within a few metres. Even at Preston dock it is present at only -3.3m OD. This would seem to indicate that the current river channel is an entirely post-Devensian feature and that the pre-Devensian lower Ribble followed another route, maybe through north Preston along a line which may link up with the rockhead low south of the M55 noted above. Upstream, at both Dinckley and Paythorne the post-glacial river has cut glacial diversion gorges in bedrock being unable re-occupy any pre-Devensian channel thought by earlier workers to lie to the north in both cases. A northerly alignment of the pre-Devensian upper Ribble downstream of West Bradford (SD745445) would not conflict with the notion of the river continuing west through the Vale of Chipping having joined the Hodder in the region of Doeford Bridge (SD650430). It would, however, lead to the lower Ribble trough carrying only the Sabden Brook/Calder drainage – a significantly reduced catchment area leading to a rather smaller stream. catastrophic – draining of the lake and the establishment of the present-day drainage system. One final late-glacial event of note is the ‘capture’ of the upper Aire drainage by the Ribble. This was not affected by normal headward erosion by the Ribble but as a result of glacial deposition between Long Preston and Gargrave. This involved the creation of a drumlin field south-east of Hellifield by ice moving in that direction into the lower Aire valley (Raistrict, A, 1933). This was followed by the deposition of a recessional moraine across the valley south of Hellifield during a still-stand of the ice front at this point. The moraine impounded a second pro-glacial lake which extended to the outskirts of Settle. Taken together, these two barriers presented an obstacle to the lake drainage which was, however, ultimately achieved through the sand and gravel in the Cow Bridge area (SD8269 5700), which directed drainage from the lake into a meltwater channel between Paythorne and Swinden, probably created as the Ribble ice stream had retreated north-east at an earlier phase (Johnson R H, 1985). In this way the nascent post-glacial Ribble collected run-off from the former upper Aire valley whose headwaters were now restricted to the high ground north of Bell Busk (SD9054 5644) and confined to the northern edge of the drumlin field. Aitkenhead, N, Bridge, D McC, Riley N J, and Kimbell, S F.1992. Geology of the country around Garstang. Memoir of the British Geological Survey, Sheet 67 (England and Wales). Chiverrell RC, 2006, Aggregate Extraction and the Geoarchaeological Heritage of the Lower Ribble, Lancashire. 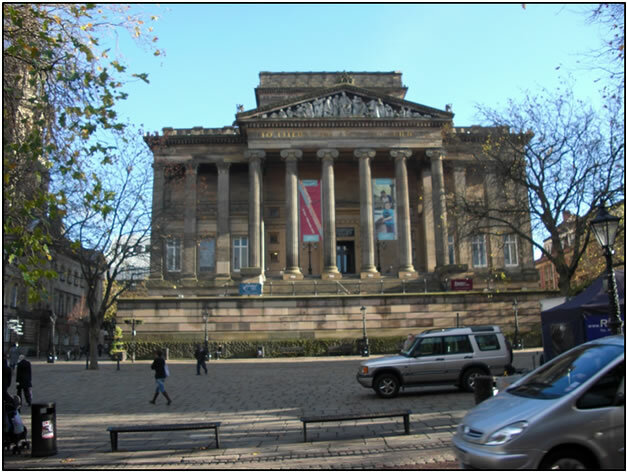 Report by Liverpool University and Oxford Archaeology North for ALSF. Carter, CF (Ed. ), 1962, Manchester and its region British Association, Manchester University Press. Earp, J R, Magraw, D, Poole, E G, Land, D H, and Whiteman, A J. 1961. Geology of the country around Clitheroe and Nelson. Memoir of the Geological Survey of Great Britain, Sheet 68 (England and Wales). Price, D, Wright, W B, Jones, R C B, Tonks, L H, and Whitehead, T H. 1963. Geology of the country around Preston. Memoir of the Geological Survey of Great Britain, Sheet 75 (England and Wales). Wilson, A A and Evans, W B. 1990. Geology of the country around Blackpool. Memoir of the British Geological Survey, Sheet 66 (England and Wales). Raistrick A, 1933, Glacial and Post-Glacial periods in W. Yorkshire. Proc. Geol. Soc. 44, 263 – 9.